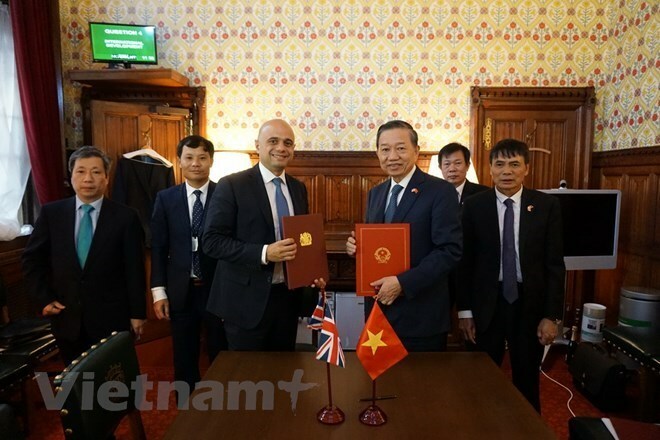 Hanoi (VNA) – Prime Minister Nguyen Xuan Phuc has recently issued a plan for the implementation of a memorandum of understanding on anti-human trafficking cooperation signed between the Vietnamese Government and the Government of the United Kingdom of Great Britain and Northern Ireland in late 2018. Accordingly, the Ministry of Public Security will be in charge of the plan, with its main tasks including making recommendations to the establishment of an inter-sector working group, and building plans and strategies and organising prioritised joint activities between relevant agencies of the sides involved. The ministry is also assigned to coordinate the cooperation between domestic sectors and localities, as well as between Vietnamese and UK competent agencies and international organisations in terms of information exchange; establishment of hotlines; investigation; arresting and transfer of human trafficker suspects; and rescuing and supporting the victims. A number of other public bodies are also tasked to join the effort. The Ministry of Defence will work to spread knowledge on anti-human trafficking across border and island areas, while intensifying border and sea patrols and security management. The Ministry of Information and Communications will direct telecom and internet service providers in circulating messages and information on the prevention and fighting of the crime via different methods. The Ministry of Labour, Invalids and Social Affairs will organise support activities for victims trafficked from the UK to Vietnam and vice versa. The aid includes the provision of accommodation facilities and community integration assistance. It will also study the revision of current support policies for the group to make them more suitable to the current demand and context.